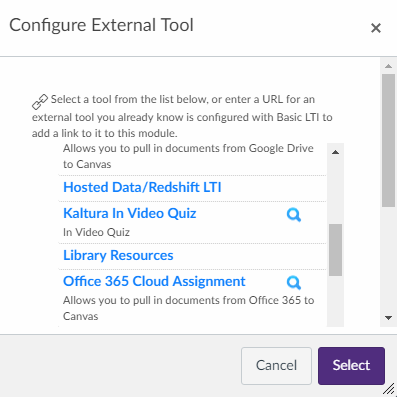 This document describes how an instructor can add a Kaltura Interactive Video Quiz (IVQ) as an assignment in Canvas that connects to the gradebook. In your Canvas course click on Assignments. Click the +Assignment button to add an assignment. Enter the assignment details including the assignment name, description, points, group, and "display grade as" settings. Under Submission Type click the drop-down and select External Tool. Under External Tool Options click the Find button. Click on Kaltura In Video Quiz from the list of available tools. A Link Resource from External Tool window will open and display a list of Kaltura Interactive Video Quizzes. If you haven't yet created the quiz you want, select Add New, then Video Quiz, and use the Kaltura editor to create your quiz. If you already have created the quiz you want, select it by clicking on the blue Select button next to the quiz. You will be taken back to the list of available external tools. Click the Select button. Set the dates you would like the video quiz to be available. If you are ready to make the video quiz available to students, click Save & Publish. Otherwise just click Save. The video quiz grade item will not show up in the Grades tool until you publish the interactive video quiz assignment.